Whip up a sumptuous meal for one, with the finest steak, chips and a classic French sauce. Because you’re worth it. Put the vinegar, white wine, peppercorns and shallot into a small saucepan and bring to the boil. Simmer until the volume of liquid has reduced to about one tablespoon. Strain the liquid into a bowl and then set aside to cool. Meanwhile, melt 100g/3½oz of the butter in a small saucepan set over a medium heat. Put the egg yolks in a bowl set over a pan of simmering water and whisk until thickened and light in colour. Gradually add the melted butter, whisking constantly. Season with salt and black pepper, add the cooled shallot reduction and the chopped tarragon leaves and mix well. Heat a frying pan until searing hot. Add the olive oil and steak and cook on one side for 2-3 minutes, before turning over and placing in the oven for 2-3 minutes. 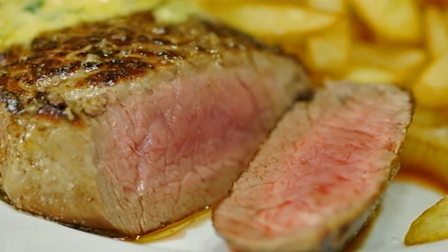 While the steaks are in the oven, carefully lower the chips into the deep-fat fryer and cook for 3-4 minutes, or until golden-brown and cooked through. Remove the steak from the oven and add the remaining butter to the pan. Spoon the melted butter over the steak repeatedly for at least 2-3 minutes while the steak rests – this will give a lovely shine and add to the flavour. To serve, place the steak on a plate, pile the chips alongside and then finish with a dollop of béarnaise sauce.